Play on the tables for your tickets! Celebrate the new look Live Casino at BetVictor! Earn your tickets to the random prize draw for cash and bonus prizes as BetVictor just revamped and relaunched their Live Casino section. All table enthusiasts have now 100+ live tables to choose from with Roulette, Blackjack, Baccarat, Poker and Super 6. Wager on any table except Baccarat to get your tickets to the raffle and you could be netting the top prize of £1,500 in cash. 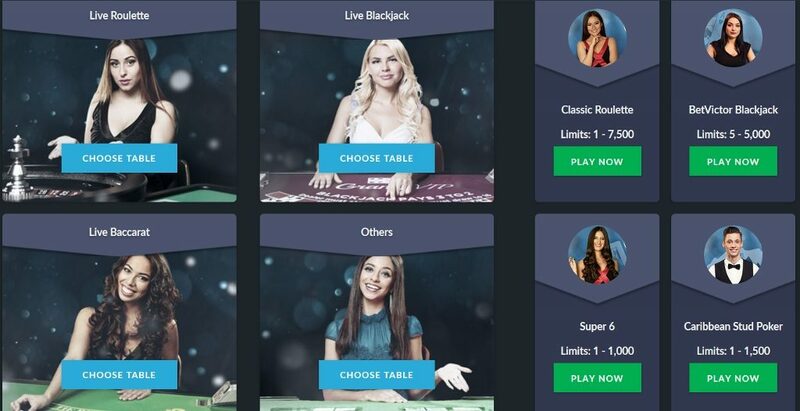 Celebrate with BetVictor the launch of their revamped Live Casino section which is holding now 100+ tables ready for all Live Casino enthusiasts and that 24 / 7 / 365. Limits from £1 – £7,500 will accommodate all types of players with any budget size. With this occasion, BetVictor will hold a raffle with 100 prizes worth a total £5,000 in cash, bonus and sports bet prizes. Raffle Tickets: OPT-IN on the promotion page and earn 1 entry into the prize draw for every £10 wagered on their Live Casino table games, expect on Baccarat. Currencies other than GBP or EUR will be calculated using internal exchange rates based on the GBP value. Only real cash wagering qualifies for this promotion. Prize Draw: A random prize draw will be held by 15:00 CET on 12th June 2017. The 100 prize winners will be picked at random from all qualifying entries. Prizes are allocated in the order the tickets are drawn. The prizes will be credited to winning accounts shortly after the prize draw has taken place. Cash prizes are immediately withdrawable, bonus prizes need to be wagered 10x within seven days, subject to the BetVictor bonus terms and conditions. Sports bet prizes can be used in the Sports section only and will not be paid out, only winnings from them will be credited to player’s accounts. In order to claim bonus or sports bet prizes players need to opt from the Offers tab.